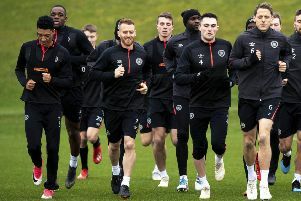 Neither has trained this week and at the pre-match press conference Hearts boss Craig Levein said: “Uche Ikpeazu has a little problem with his knee and Peter Haring landed awkwardly and had a problem with groin. Levein continued: “I’m hopeful that they will be fine. “I don’t think the injuries are serious so I would expect them to both be available. “If either of them doesn’t prove what we expect in the next couple of days then obviously I need to do something different on Saturday.